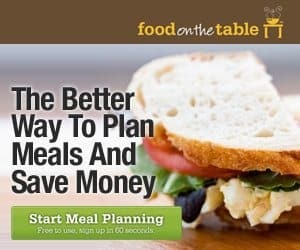 Meal planning is the number one way I save money! By planning out my meals, snacks, and drinks for each week, I am able to quickly put together a grocery list and head out. By sticking to my list (and using the coupon database to get the lowest price possible! ), I was able to cut my grocery expense by half AND increase the amount of fresh herbs & produce we purchase. Starting next week, I will be sharing my menu plan for each with you on Meal Planning Mondays! If you are looking for an easy way to maximize your savings and get rid of the last minute “There's nothing for supper – delivery please”, Food on the Table offers a great service. Its a simple 6-step process and you don't have to waste a ton of paper when you change your mind, as I frequently do. Start by picking which store you plan to shop at. You can select more than one store.Then, set your food preferences (poultry, beef, shellfish, pork, fish, sausage, lamb, and exotic meat). You can also vote to add new collections in! Once you've selected your recipe collections, you get to choose individual foods. For example, its showing me that cube steak is on sale at my store so I want to check it and a few other meat items that I would like to feature in a main dish. Now the fun starts! I get to pick out which recipes I would like to use & even add my own. Once I've picked all my recipes, I just need to fine-tune my grocery list and print it off. They even offer apps for Android & iPhone! Interested in getting started? Click the banner below! You will receive a free trial (no CC required) and have the option to switch to a paid subscription. I'm still using the free, but switching to paid next week. Its $15 for 3 months!